Is Thailand Safe for Tourists Anymore? You are here: Home / Travel / Is Thailand Safe for Tourists Anymore? The shooting of 22 year old Stephen Ashton on the island of Koh Phangan on New Years Eve has again brought into question the safety of holidaying in Thailand. The young British backpacker was celebrating New Years Eve at Zoom Bar on Had Rim Beach when a fight broke out between rival Thai youths. One youth then fired into the crowd, killing Stephen who was dancing with friends. Another Thai man was injured. Although Stephen Ashton's death wasn't intentional, it was a mindless and wholly unnecessary killing, and 2012 was a shocking year for attacks on tourists in Thailand. There was the fatal stabbing of Australian travel agent Michelle Smith, the stabbing of Mohamad Zubair Edwa, the vicious attack on Muay Thai fighter Daniel Ketley, and the stabbing of Jack Cole in Ao Nang as he protected his girlfriend from a local gang. But was 2012 just a particularly bad year? Is Thailand getting more dangerous or has it always been this way? I lived on Koh Samui for near on a year between 2008 and mid 2009, and a week never passed without reports of a shooting (Thai on Thai, usually), a mugging or an incident of theft. Indeed I had my ground floor apartment burgled one sunny Sunday afternoon. I spent many days working online at my friend's travel shop, where tourists would regularly come in telling stories of having money and jewellery stolen on boat trips and such. Just this past week during my annual trip back to the UK, I encountered a woman in the park who, after telling her I lived in Thailand, shouted, “Don't talk to me about Thailand!” She explained she was robbed of 500 pounds on her first day in Koh Samui, and that her daughter had a three thousand pound necklace stolen at a 5* hotel. Thing is, turns out she put the money in an unattended bag during transport, and her daughter forgot to put the necklace in the safe! Christmas came early for the maid. And that's the case with most of incidents of theft in Thailand. People forget they are travelling to a developing country with a largely poor population, of whom 70%+ earn under 150 pounds per month. Opportunist theft is bound to be a problem, as it is in the majority of tourist destinations and major cities around the world. But for every negative story I hear twenty or more positive experiences. Indeed my mum and dad (65 and 66, respectively) visited Thailand for three weeks in December this year and had a wonderful time in Phuket and Bangkok. I did, however, have to tell my mum to be careful with her belongings, particularly not to walk with her handbag on her shoulder facing the road. 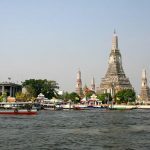 Bangkok has experienced a rise in motorcycle handbag theft in the last year, again though, not something new; in 2009 Lydia Riach died after having her skull shattered when she was dragged along the ground by bag-snatching motorbike bandits. Thailand is such a smiley, happy, peaceful place on the surface, and it's easy to forget that there are thieves and opportunists lurking, and that there are gangs and mafia organisations at work. Violence can and does occur; I've seen many a Thai man go from a smiling, happy go lucky demeanour to violent lunatic after a bottle of whisky and losing a bit of face among friends, as I have also seen in my home country, too. The point is that Thailand is no different to anywhere else in that respect. People occasionally fight, youths do go wayward and people do commit crime. Is it worse than neighbouring countries, the US or the UK? I haven't seen any reliable statistics but I doubt it very much. 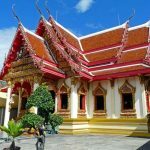 The majority of crime I read about occurs in the hedonistic seaside resort of Pattaya, the party district of Patong (Phuket) and at events like the Full Moon Party on Koh Phangan. Which is obvious, really, because opportunists will frequent tourist populated areas where people are relaxed, enjoying themselves and generally taking leave of their senses. Alcohol is no stranger to violence, either, and where there's regular consumption of alcohol there is likely to be an incident sooner or later. Overall though, I have felt safer in Thailand over the last 5 years than I ever did in London. I was mugged twice in London during my teens, once stabbed and the other a simple threat and robbery scenario. Touch wood I have never felt threatened walking late at night in Bangkok, or catching an empty Skytrain carriage. But what I do make sure is that whenever I am walking around the city, or travelling to the islands, that I don't wear/carry expensive jewellery, and that my money is strapped to my person. I use the safe in the hotel room, and I never carry more cash than I can afford to lose. I am also aware that the islands can be law unto their own. And as such I am cautious about walking around on my own, or with my wife, late at night, especially near the beach. One other point I'd like to stress is that where possible always pay that bit more for your travel. If you can take a plane over a bus, and beware of cheap, overloaded boat rides. What happened to Stephen Ashton was a tragic accident, and my heart goes out to his family. But this is one shooting out of 23 million tourists in 2012. I won't deny there have been plenty of other negative incidents, but in truth many could have been avoided if the individuals exercised more caution. 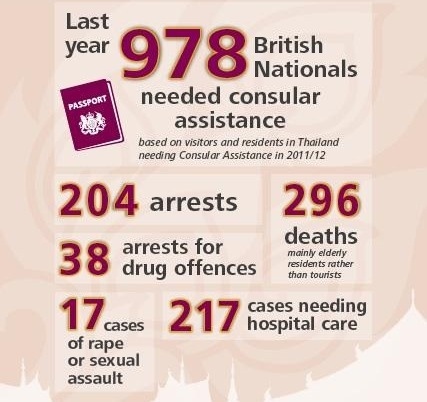 The Thai authorities and the British consular have a role to play in this too. They should make more effort to educate tourists on the dangers, and provide a “safe practice” code for those visiting the land of smiles. Safety in Thailand is about using your smarts. Of course no one can predict an accidental shooting, but one can think one step ahead of a thief, and if identified early enough, one can take oneself out of a potentially hostile situation. I have always been both puzzled and amused at how human beings tend to worry the most about the things that are actually the least likely to kill them. And I guess we can put most of the blame for this on the media and the irrational nature of human beings. Let me explain that. Over 50 million people die on this planet every year – over a million in this country alone – and of these the media hand picks the few that it knows the public will find the most shocking, tragic, or controversial and then splashes them across the headlines. And when we are constantly being slapped in the face with these sensationalist headlines we tend to start worrying that we might become the victim of such a crime or accident no matter how unlikely this actually is.For example mass shootings are of great concern to many people here in the USA yet less than 500 people have actually died in such shootings over the past 15 years. To put this in perspective this is about the same number of people who have died from lighting strikes here during that same time period. And in this time period about 15,000 people have died from choking and about 50,000 from drowning in one of our many rivers, lakes, swimming pools, and oceans. And about 10,000 people died in this period from accidentally being shot with their own guns. This last statistic by the way shows how utterly insane it is that some people actually want our teachers to carry guns as a way to “prevent” school shootings. Incidentally, I’m not anti-gun by any means, and in fact I grew up shooting and still shoot hand guns to this day. Facts are facts however, and it’s pretty clear that having guns causes a heck of a lot more deaths than they prevent.Anyway whenever one of our citizens is killed in another country it makes the headlines back home and, crazily, this causes people to somehow think that its now dangerous to travel to this country. The fact of the matter is however that in most cases this person (or persons) was statistically just as likely to have died in his own country. In fact if you are an American you are clearly thousands of times more likely to be killed by your own gun back home than you are to be shot in Thailand. And if you are an American woman you are much more likely to be raped on your own college campus here than you are to be raped while staying in Thailand. And if you should live in a particularly dangerous neighborhood here - such as South Central Los Angeles - you are probably actually much safer in Thailand than you are back home.I have spent a lot of time in Thailand over the past 25 years and not only have I never been the victim of a crime there but I have never even been scammed or taken advantage of in any way (not even by the police or bar girls). Also, I would say that the biggest threat to your life in Thailand by far is being involved in a motorbike or car accident. In fact most of the accidents I personally came across involved Farang (White foreigners) and I would hear about them dying in these accidents all the time (they are usually too stupid to wear a helmet).The bottom line is I have always felt perfectly safe in Thailand. Of course I also always keep my wits about me when there and my finely tuned radar always allows me to spot potential trouble in plenty of time to avoid it. So, as long as you take certain common sense precautions and keep your wits about you, you should all be fine as well.My closing advice would be to just stop reading the news and enjoy your travels. Very true Ken. I feel much safer in Bangkok than I do in central London. Most crimes in Thailand involving foreigners seem to happen in the early hours of the morning during a drunken stroll home. Like any country, just be sensible. Don't put yourself in vulnerable positions that make you a target. There are opportunists everywhere in this world; Thailand is no different, but generally I find it very safe. Yeah, except for the perilous driving conditions, it really is a very safe place in my opinion. By the way, after my initial comments the other day on how traffic accidents are the biggest danger in Thailand I decided to actually look up the W.H.O. statistics on this and apparently Thailand is the second most dangerous country in which to drive on the entire planet. And I have to admit this surprised even me.But of course if you die in a traffic accident overseas it does not make the national news back home in your own county. You have to get raped, murdered, or kidnapped to make the headlines back home. And thus people worry obsessively about these extremely rare cases they read about in the papers and forget that they are actually thousands of times more likely to die in a traffic accident in Thailand than to be murdered or raped there. Not that dying in a traffic accident is something you should spend any time worrying about either. Just keep your eyes on the road and always be ready for anything rather than getting complacent. Overall I feel much safer in Bangkok and Thailand than I did in London, apart from maybe the crazy driving!Like you say though, it is very easy to let your guard down after a while and forget that behind the smiling faces, things can still go awry.I've not had anything stolen in Thailand (touch wood) and lets hope it stays that way! I just had the one burglary incident when my camera was stolen. Apart from that I left my phone in a cab, called it but never got it back...but hey, they would happen in most places, I'm sure. Overall, I have to agree, as a woman who has lived in Thailand for about 3 years, I feel safe.That said, I have had friends who have been violated and mugged/robbed. But I've also had a dishwasher at the Paragon food court in BKK, chase down my friend and me, when he forgot his bag.We live in a world that is becoming increasingly smaller, so news is faster and I daresay in Thailand, news of foreigners deaths and etc, is becoming more accessible. Unfortunately crime is everywhere but being 'situationally aware' is an important first step, and hopefully with articles like these, and Thailand's rising middle class, crime will fall.